Congress Rahul Gandhi and the chief ministers of West Bengal, Andhra Pradesh and Kerala have been invited to address the gathering. Farmers took to the streets of Delhi on Thursday to demand a special 21-day joint parliamentary session to look into the passing of two private members bills. According to reports, around 20,000 farmers are making their way to Ram Lila Maidan on Thursday and the numbers may go up to one lakh by Friday. 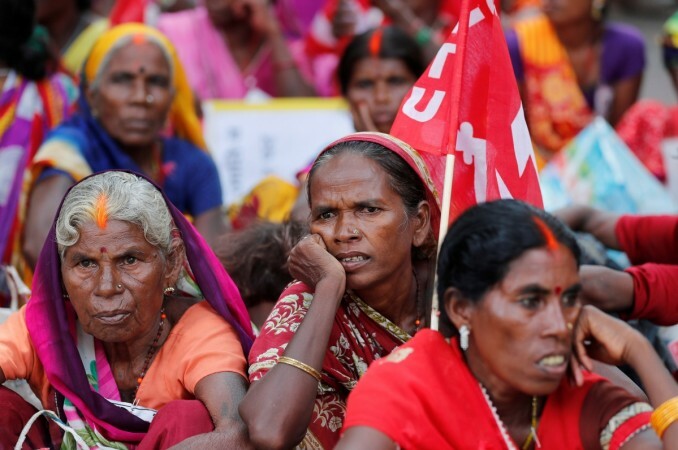 The two-day Kisan Mukti March is the 'largest congregation of farmers', reports HuffPost. The protestors are demanding the Farmers' Freedom from Indebtedness Bill and the Farmers' Right to Guaranteed Remunerative Minimum Support Prices, loan waivers, price subsidies and the implementation of the Swaminathan Commission. According to the All India Kisan Sangharsh Coordination Committee (AIKSCC), the farmers will embark on a 25 km march from Brijwasan, going via Majnu Ka Tila, Nizamuddin, and Anand Vihar. The march will culminate on Friday, November 30, with a walk from the Ram Lila Maidan to the Parliament. "On November 30, the farmers will start their march from Ram Lila Maidan to Parliament. At Parliament Street, farmer leaders will speak on agrarian issues and also leaders of different political parties barring the BJP will address the gathering," said CPM leader Hannan Mollah told NDTV. Yogendra Yadav, a member of Kisan Andolan, said that farmers from distant places like Meghalaya, Gujarat, Jammu and Kashmir and Kerala will be taking part in the protest. "For the first time in the history of farmers' movement in the country, over two hundred farmers' bodies have assembled under one platform. This is an opportunity for us to compel the government to listen to the woes of farmers and hold a special session for farmers in Parliament," Yadav said. Hindustan Times reports that volunteers from Ambedkar University, Jamia Millia University, Jawaharlal Nehru University and Delhi University will assist the farmers to reach Ram Lila Maidan. The is the latest of several protests that the farmers have staged in the recent past. Last week, a mega rally by farmers took place in Maharashtra demanding Chief Minister Devendra Fadnavis to keep up his words and provide some relief for farmers. In October, a rally held by the farmers was stopped midway when they were denied entry into the national capital and the police resorted to water cannons and barricades to control the situation.